Happy Sunday, thanks for stopping by! I hope you're all staying warm, the local weather shows possilbly 12" of snow coming my way, so I'm sending a little bit of Spring your way. I used the Maker Watercoloring Technique to color the Inked Poppy, then used the Wisped Frames Technique to add the color around the image. Wisped Frames is becoming my new "go to" technique these past few days. It's sure a great way to fill in the white space surrounding your images. Lisa, this is GORGEOUS! Girl, you can watercolor!!! 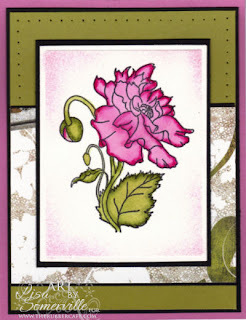 I LOVE the way you water colored the flower - GORGEOUS card! !